Returning to Oaks Gourmet, let us once again consider a basic sandwich, upscaled. Aside from a heaping pile of pulled short rib, the Braised French Onion Short Rib French Dip from Oaks Gourmet contains braised onions, horseradish cream and truffled watercress on a toasted baguette, with the sherry au jus served on the side. That’s quite a sandwich, although not one that is entirely comprehensible. The question of how one truffles watercress is raised, for example. I suspect they mean that they’re using truffle oil, but the fact that they don’t just say that is rather suspicious. But aside from any nefarious truffling, this was was a really good sandwich. It wasn’t quite everything it’s supposed to be, I suspect, as it was not particularly earth shattering and wasn’t really a subtle, layered sandwich. 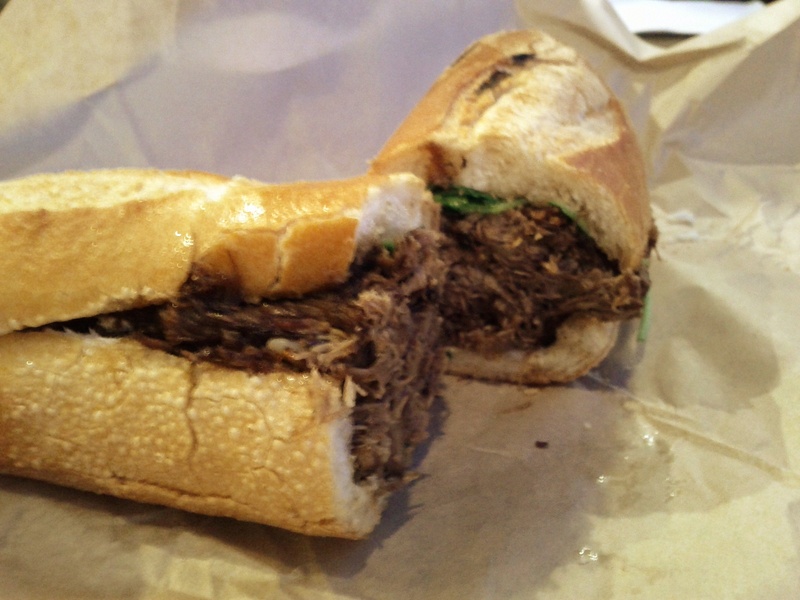 But it was everything one wants a french dip to be, which is to say, a big pile of really rich meat. There wasn’t enough horseradish on it for my taste, but this wasn’t the first time that’s happened and it certainly won’t be the last. Judging by this and the short rib sandwich from Little Chef Counter, I’m inclined to say that short ribs are a severely underutilized sandwich ingredient. It’s incredibly rich, savory, and it can be an incredible background for other flavors. Serving this sandwich with about half the meat present would have set up that background and left some room for the watercress and its truffling to play through, but as it stands it was all short rib. There are far worse things for a sandwich to be, though, so consider me satisfied. This entry was posted in Sandwich Reviews and tagged Beef, Los Angeles, Needs More Horseradish, Reviews by Pete, Sandwiches I Have Eaten, Sandwiches Made For Me by Pete. Bookmark the permalink.